ABOVE: The main entrance to Tivoli at night. (Fireworks are by the Barfoed family, which has supplied pyrotechnics to the park for six generations.) INSET BELOW: Copenhagen's City Hall above Tivoli's treetops, and a couple enjoying an evening in the gardens. 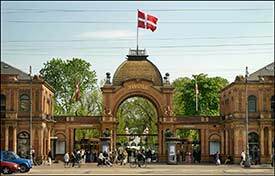 In a world where amusement parks spend millions on high-tech roller coasters and movie-theme rides, Copenhagen's Tivoli Gardens are a delightful anomaly: a park where you can enjoy carnival thrills, eat p�lser sausages under the trees, swill �l in a beer garden, dine in an elegant restaurant, attend a symphony concert, enjoy free pantomime theatre, or sniff the 115,000 flowers that bloom during the park's season. 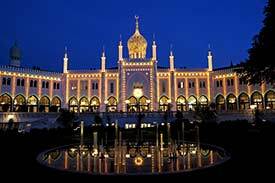 Tivoli opened in 1843, after a Danish architect named Georg Carstensen talked King Christian VIII into leasing him a site for a park modeled after the now-defunct Parisian Tivoli and Vauxhall Gardens in London. Tivoli's charter required that 75% of the site had to be open space, and that rule--still observed--is one reason why Tivoli feels more like a public garden than a theme park. A buglike roller coaster whirls through the treetops; a Ferris wheel overlooks park benches and flower beds; small motorboats make circles on a scenic lake. While teenagers play games in video arcades, their younger siblings enjoy a clown show or wave at the costumed king and queen (both of whom are children) in the Tivoli Guard parade. Business people wheel and deal over expense-account meals, and lovers cuddle on benches as 110,000 bulbs create a romantic glow from dusk until closing time. There is music everywhere. Some 150 concerts--in all genres, 100 free--are held in Tivoli Concert Hall and other stages roundabout during the 4-1/2-month park season. The concert hall, which has its own off-season entrance, is open year round. Here such greats as Sibelius, Stravinsky and Rachmaninoff have conducted their own works. Here Duke Ellington, Count Basie and Elton John have delighted their audiences. Tivoli's own symphony orchestra gives concerts all year, with well-known guest conductors and soloists. In fact the park invests over a quarter of its income in free events such as concerts, circus acts, pantomime performances and magnificent nightly fireworks displays. ABOVE: Miniature trams in Tivoli Gardens. INSET BELOW: Tivoli at Chrismas, the Nimb Hotel's Moorish-style building, and a chef at Nimb Brasserie. Tivoli operates daily from late April until late September. The gates open at 11 a.m., closing at 11 p.m., midnight, or 12:30 a.m., depending on the day of the week and the season. Tivoli is also open in mid-October for an early Halloween celebration, and it has a Christmas Market from late November until the end of December. See the official Web site (listed below) for details. 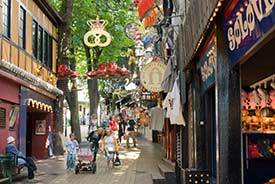 Tivoli isn't cheap: In 2018 (when this article was last updated), the standard entrance fee for adults and children of 8+ years is DKK 120. Kids from 3 to 7 pay DKK 50, and children under 3 are free. Individual rides require one to three tickets, which are needed by anyone over 1 year of age. You can buy an unlimited multi-ride ticket with your admission or at any ticket booth in the park. Tip: Most of Tivoli's rides are pleasant rather than thrilling. You might want to save most of your ride budget for Bakken, a 400-year-old amusement park north of the city that has one of Europe's highest roller coasters. For more information on discounts and special packages, see Tivoli's prices page. Tivoli has dozens of restaurants, caf�s, pastry shops, snack bars, and food stands. For a pleasant meal in an authentic Danish atmosphere, try Gr�ften near the Pantomime Theatre. Its family-friendly beer garden is delightful after dark, when the tables are illuminated by lanterns in the shape of hot-air balloons. 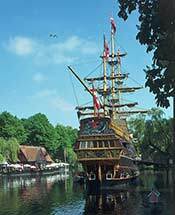 We also recommend Pirateriet (where you can dine on the deck of a Caribbean-style pirate ship) and the Brasserie of the Nimb Hotel, in a mock-Moorish castle facing the Tivoli gardens. It's easy to empty your wallet at Tivoli, and park businesses will happily accept dollars, euros, British pounds, and Scandinavian currencies. Fortunately, the park has several cash machines. See our article on European ATMs and currency exchange machines for advice on using your ATM card overseas. 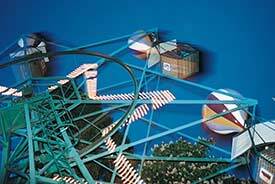 The official Tivoli Web site has everything you need to know about the park, including an interactive tour page and listings of concerts and other events. From Europe for Visitors, an illustrated 27-page city guide with Web links. Tivoli has gardens, lakes, bandshells, fountains, and streets like these (which are hybrids of a village and an amusement park). 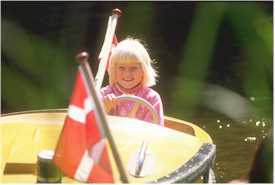 A diminutive Dane enjoys a boat ride at Tivoli. Morten Bjarnhof took this picture of a Ferris wheel whirling above Tivoli's visitors and treetops. 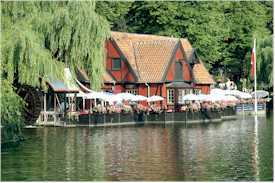 The thatched-roof restaurant Faergekroen overlooks a lake. Nearby, Pirateriet--a family-friendly restaurant with a pirate motif--serves Caribbean-themed meals on the frigate Sct. Georg IIII. 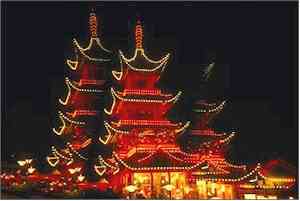 The Chinese Tower is another restaurant on Tivoli Lake. It serves a Chinese buffet and Danish dishes, and its Chinese chefs come from Hong Kong. Nimb, in a Moorish-themed building formerly known as The Bazaar, opened in 2008 as a boutique hotel and restaurant. 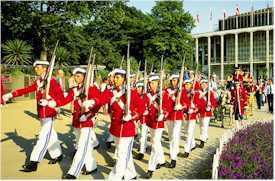 Take time out from eating and amusement rides to watch the daily Tivoli parade, featuring a children's drill team and a pint-sized version of the royal family. 2nd inset photo copyright © Christian Alsing for Visit Copenhagen.